Does Your Foodie Friend Need Another Spatula? Eric Ripert, pictured at a recent benefit, shares secrets from a world-famous kitchen, in his new book "On the Line"
We've been scrolling through the cooking/kitchen/baking books for days as we search for the tastiest Christmas gift for our favorite foodies, and we've found a restaurant-focused tome that has some real meat on its bones beyond the usual stories from the stove. Vroman's Bookstore is throwing a lunch with famed chef Eric Ripert on Monday, December 8, at the Bistro 561, and while it looks a bit late to slip into a seat, you can still replicate much of the day for the gourmet you adore. 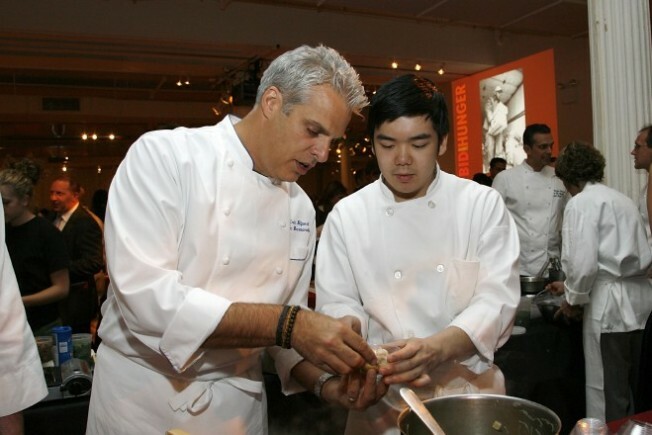 First order: Purchase "On the Line," the new kitchen-insider-y book by Eric Ripert. Chef Ripert's name is enough to make most eatery aficionados drop their forks; the man, after all, donned the toque at Le Bernardin in New York City, a fabled landmark that nabbed three Michelin stars. Second order: Take your foodie friend out for lunch at Bistro 561, the restaurant located at the California School of the Culinary Arts. It's only open weekdays -- it is located at a school, after all -- but it is open for lunch as well as dinner, which we applaud (more places serving lunch, please). Third order: Slide festively wrapped book to foodie friend across table after the salad but before the entree. Fourth order: Receive hugs, oh-my-goshes and thank yous, and probably an excellent edible present next Christmas.